Here's an easy way to remember birthdays forever! Create a birthday tracker in you bullet journal. What is a Birthday Tracker? It's a page in your bullet journal to write down all of your friends' and family's birthdays for the entire year. Then at the beginning of each month, you'll refer to this page and record the upcoming birthdays. It's time to party! Now you can send gifts, cards, or even text messages with well wishes for those you care about. At the end of the year transfer this page to your next bullet journal or planner and you are set for the upcoming year. Your friends and family will think you are a genius because to never forget a birthday. You don't have to tell them it's because you have an awesome (and easy) system in your bujo! If you are new to bullet journaling, here are some pages to get you started: Beginner's Guide to Bullet Journaling and Bullet Journal Supplies. Now it's time to create your own birthday tracker page in your bullet journal. Here are 12 awesome and inspiring ways to create fun and easy to follow birthday trackers. 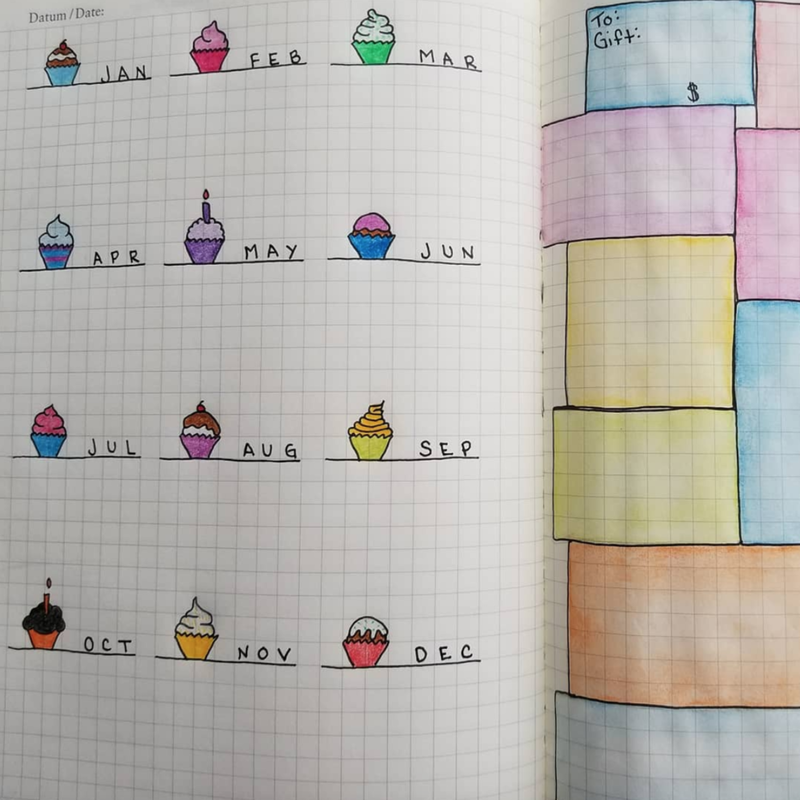 Kj_lettering_and_bujo created a birthday timeline spread in her bullet journal. Using markers and a "party like it's your birthday" quote, each important birthday is highlighted on the timeline with a balloon. Bujo.snowberry created a colorful birthday wheel. Using the colors of the rainbow, this wheel highlights birthdays and important holidays for the entire year. Bullet_journal_journey used pretty pastels to create a birthday tracker. Along the top, Happy Birthday is spelled out in balloons. Below, each calendar month is listed along with a section to record important birthdays. The birthdays are also highlighted on each calendar for easy reference. Crisdawn8 goes crazy for cupcakes! Each month features a delicious baked treat to highlight the upcoming birthdays. "Eat cake and remember that somewhere it is someone's birthday." This lovely quote page was created by Kittyblackadder's birthday tracker page spread. The opposite page provides spaces to record the upcoming birthdays for each month. a.freckle.a.day proves that you can create an elegant and festive birthday tracker in a minimalist bullet journal. Journalphine presents a birthday tracker designed by making simple boxes adorned with banners colored in a rainbow of shades. Columns a topped with candles, birthday presents, cake, and balloons. Handboundpress created a banner that takes center stage on this clean and simple birthday tracker in her bullet journal. Mildliner used to decorate the banner and highlight the months. Worldwidescrapbookingsupplies features a birthday tracker covered in balloons. A balloon for each month with space to write the upcoming dates. 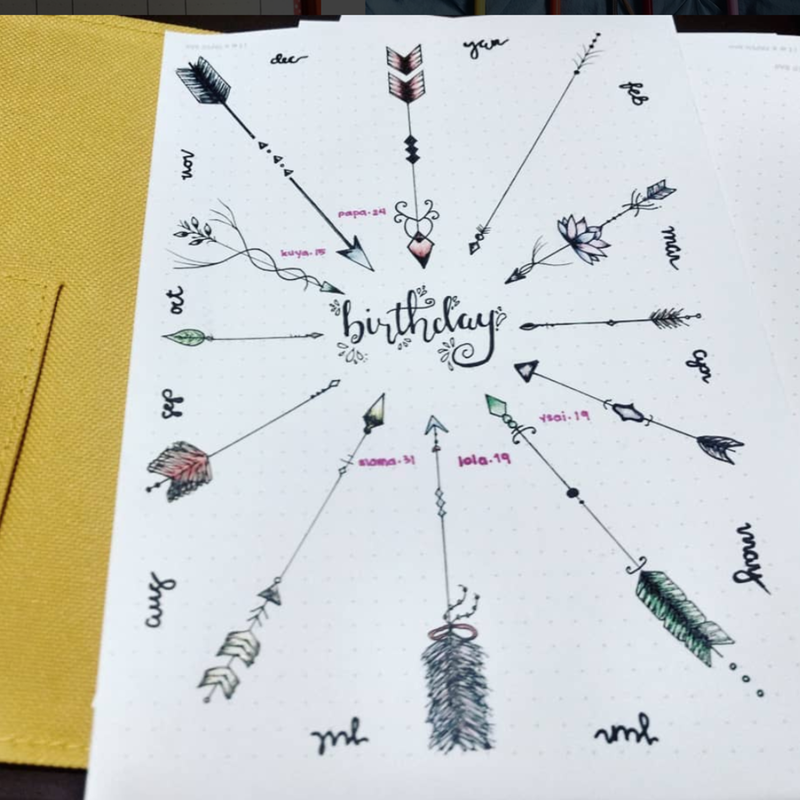 Nicolebalagtas created a unique birthday log for her bullet journal. Arrows arranged like the numbers on a clock with space in between for recording upcoming birthdays. Myartsybujo made a birthday timeline for the year. Beautiful Happy Birthday in calligraphy across the top sets the festive tone for this page. Each month on the timeline was written out then adorned with a candle for each birthday to remember. Washi tape along the top and bottom frames this birthday log. Uschka89 uses packages for every month with space for writing birthdays. The page is then decorated bunting, balloons, candy, cake, party hats, confetti, and stars. 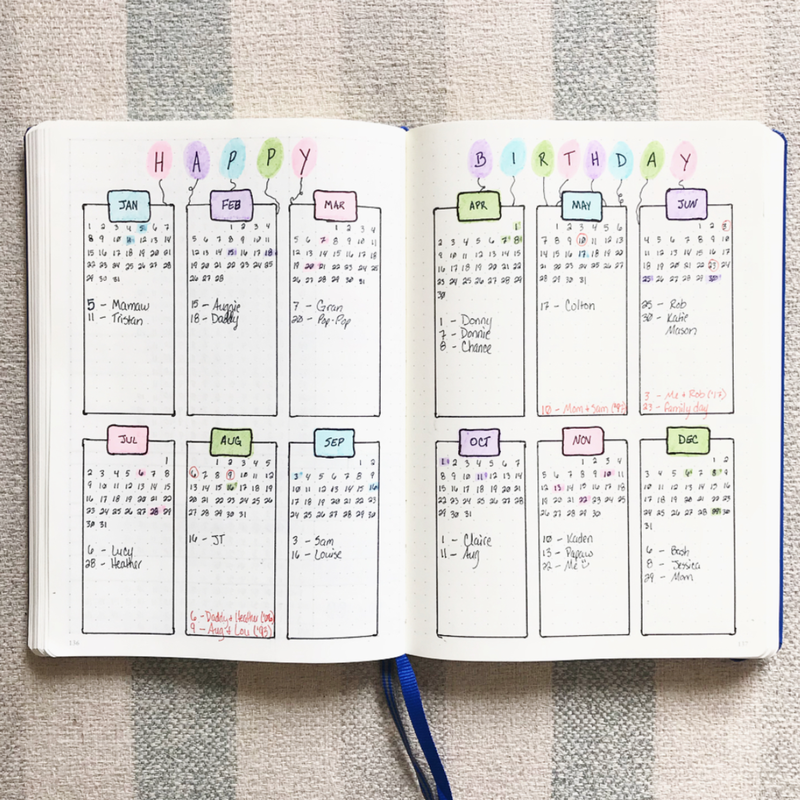 How do you track birthdays in your bullet journal? I'd love to hear.